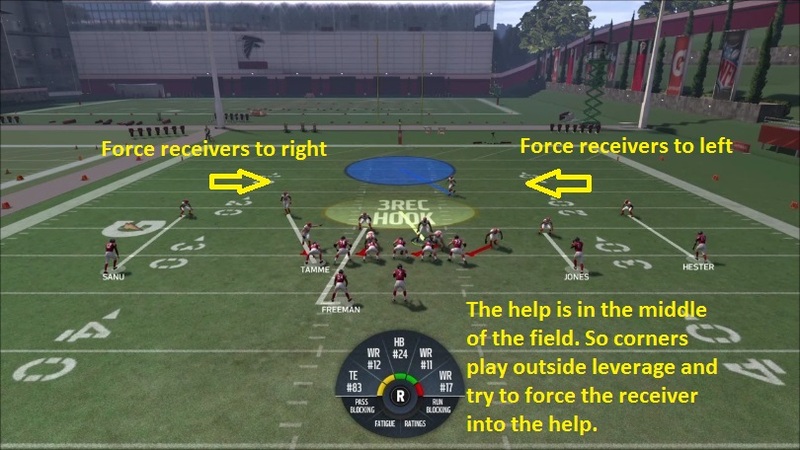 Cover 1 is a man defense that is identified by it's single high safety. In a basic version of cover 1, there is one deep safety defending the deep middle and the rest of the players are either rushing or playing man to man defense on a potential receiver. Cover 1 is in the single high family of coverage's. The deep safety is the last line of defense in this coverage everyone else is underneath. His job is to defend anything that comes into the deep seams. The routes he normally defends are deep posts, inside verts (streaks), and if he is really aggressive inside breaking dig routes(this is dangerous though). The the underneath defenders use the deep safeties as help and if possible force their receivers into the safety. The job of the underneath coverage is to play the receivers. Usually, in cover 1 the defenders align(especially the outside corners) in an off-man coverage. The reason for this is because of the position of the deep safety and the lack of over the top help. With the safety in the middle of the field, he will have a hard time defending outside verticals routes by receivers. So, if the outside receivers beat the corners deep it is usually a touchdown. As when we talked about attacking man defense, you want to look for favorable match-ups. Well, on defense you want to have the match-ups your favor. First, you want to make sure you put your defensive players in match-ups they can win. Second, you want to funnel receivers as best you can to your help( free zone defenders). Your help in cover 1 is usually in the middle of the field. Depending on how many players rush you can have more than 1 players in the zone. For example, if you rush 5 you likely will have 1 middle safety who can help. He stays in the deep middle or can be used to break on any inside breaking routes. 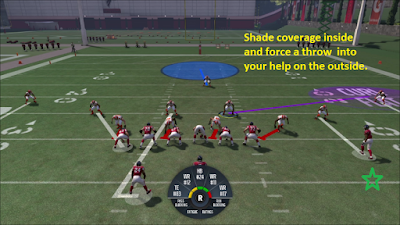 This also means depending on how good shading works on the game you may want to shade receivers to the outside to contain outside routes and if they go inside run them into your zone help. Through the years of playing different games, cover 1 has been a tough coverage to run consistently especially from off-coverage. You can press which has been better for man defense but, with just one safety deep if any of the outside receivers have a speed advantage on your corners you can give up a touchdown. Since cover 1 is single high defense it can be good against the run (as long the QB isn't a runner). The single high defense allows the defense to gain the numbers advantage against the offense. So if you feel the offense is likely to run, playing cover one can do a good job containing the play. 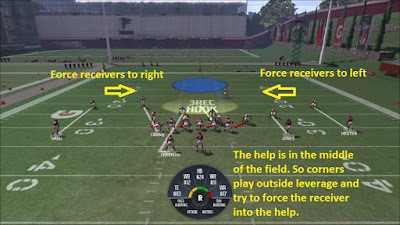 Cover 1 is usually better against inside runs then outside runs. This has to do with contain defenders and cover 1 having to use the lineman to contain the ball. However, that is more of an advanced concept and for a future post. The thing to remember is cover 1 is good versus the run game. In the passing game personally, think cover 1 is best for inside the red zone(inside the opponents 20 yard line) with press coverage where the deep threat is not a factor. Another play is on 3rd and short(or 4th and short if they like to go for it on 4th down) where your opponent is less likely to risk throwing deep(low percentage throws) on a crucial down. You can also mix and match the way the zone defenders play. If you rush four then you can have two zone defenders in the middle. You can change their assignment to a curl/flat zone and shade receivers toward the middle of the field forcing them into your help. Note: Star represents star receiver. There are countless combinations you can make up help strengthen your coverage and help defenders who may be at a match-up disadvantage. 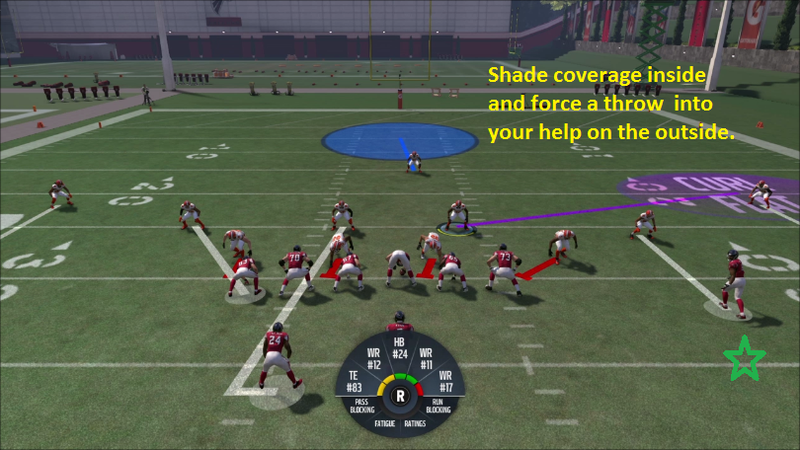 In future posts, we will talk about how to cover 1 and go into the rest of the most common coverage. Cover 1 is a 1 high man underneath defense. Defense usually in off man because no safety help on deep outside passes. Match-ups are the key to man defense in the passing game. Change the type of zones your players have to take away specifics routes and protect certain defenders. Thanks for reading please comment and share.